Sulb Steel, a joint venture between Bahrain-based Foulath (51 per cent) and Japan’s Yamato Kogyo, has embarked on cost-cutting in the wake of low steel prices and dumping, a senior official says. The company, whose main production facilities are in Bahrain’s Hidd Industrial Area and adjacent to its pellets supplier Bahrain Steel, began commercial operations less than three years ago. The company utilises 1.8 to 2 million tonnes of pellets from Bahrain Steel and is one of the few steel plants in the world that have an integrated operation. Its Saudi unit, Sulb Saudi, operates from Jubail in the Eastern Province. The unit, which functioned for 15 years and operated under another name until it was taken over by Sulb in 2011, receives billets produced at Sulb Bahrain. 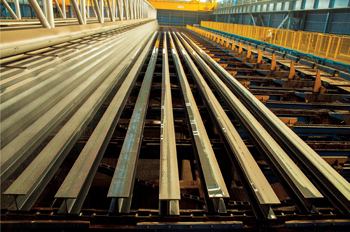 Sulb Steel has a total capacity of 1 million tonnes for angles, beams, flat beams and channels. In Bahrain, the company produced 400,000 tonnes in 2015 and had beams as its best-selling product, amounting to approximately 90 per cent of output. Around 10 per cent of production was made up by angles. The company also produces flat beams and channels but in insignificant quantities. “Some 40 per cent of Bahrain’s production goes to the UAE, another 40 per cent to Saudi Arabia and the remainder to Qatar, Kuwait, the wider Mena region and Germany. The company has capability to make sheet piles that have applications in the construction of wharfs and jetties but is currently not producing them because of poor demand. In earlier years it had low-volume orders but Fuerthner highlighted that production would not be feasible if there was no continuous production at the plant. Sulb Saudi produced around 350,000 tonnes of steel, mainly for angles and light sections up to 200 mm whereas the Bahrain plant can make medium and heavy sections from 200 mm to 900 mm. Demand for angles has declined in Saudi Arabia, said Fuerthner. 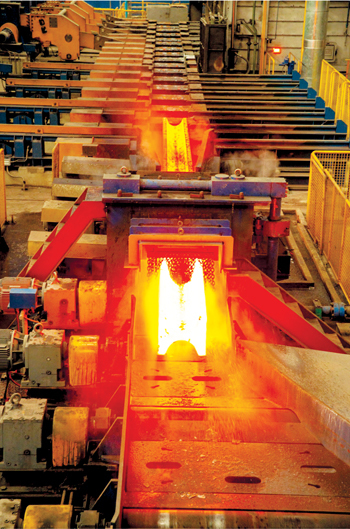 Sulb Saudi’s hot strip mill has capacity of 400,000 tonnes against Sulb Bahrain’s 550,000 to 600,000 tonnes. Sulb Bahrain also has a direct reduction iron mill whose nominal capacity is 1.5 tonnes annually. Sulb Bahrain’s melt shop has a capacity of 1 million tonnes annually and is expected to produce 850,000 to 900,000 tonnes in 2015 compared with 900,000 tonnes in 2014. The Bahrain operation expects to achieve full ramp up in 2017. “Sulb needs a lot of learning and fine tuning,” said Feurthner. “We have close cooperation with Yamato Kogyo and we exchange staff. The official said the company was keen it produced more beams, angles and other products and would not say what production target it is looking at in 2016. “The market situation being what it is, it is not possible to make a serious forecast. The market is really quite turbulent,” he commented. “We have also to consider the fact that many steel producers are partially closing their production including ones in the Mena region. Fuerthner said at the time the Sulb plant was being constructed, demand was larger than what it could produce and there was no GCC manufacturer producing structural steel. Capacity was now adequate but protection was needed. The official said it was natural in the circumstances that Sulb would initiate cost-cutting measures. The company was cautious not to retrench staff but was looking at cutting consumption where possible of electricity and water. The initiative commenced in October of 2015 and would go on for three years with the objective of bringing down variable costs by 20 per cent. Sulb Bahrain has total staff of 624, of which 35 per cent are Bahrainis. Foulath is a holding company and investment vehicle for metal industries across the Middle East region and is owned by Kuwait Foundry, Gulf Investment Corporation, Al Kharafi Group and Qatar Steel.